After weeks of rumours and wild conjectures, Baltimore duo Beach House are finally sharing a first taste of their fourth studio album, Bloom, due for release on May 11th via Mistletone Records/Inertia. Expectations are pretty high for this new LP, especially after the success of the duo’s 2010 album, Teen Dream, which spawned a few memorable singles and remixes. 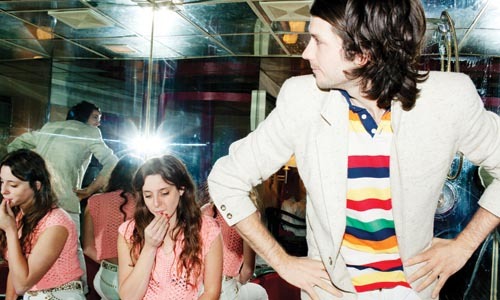 Beach House’s new single “Myth” was recorded in late 2011 at Sonic Ranch Studios in Tornillo, TX and mixed at Electric Lady in NYC. The song’s spiraling guitars and gentle drums provide a velvet lining for Victoria’s warm vocals. The album that will follow in May was largely designed on the road, during two years of tour. Throughout this period, melodies, chords, rhythms, words, and textures surfaced in moments of their own choosing. These spontaneous ideas were later gathered and developed in Baltimore, with Chris Coady as co-producer.